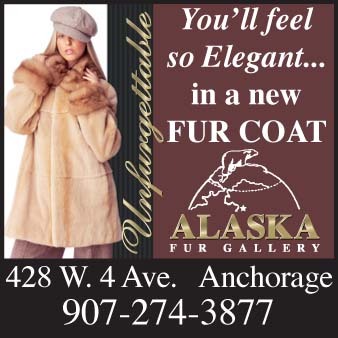 This unique community located in the beautiful Tanana Valley is the gateway city to the state’s vast interior. 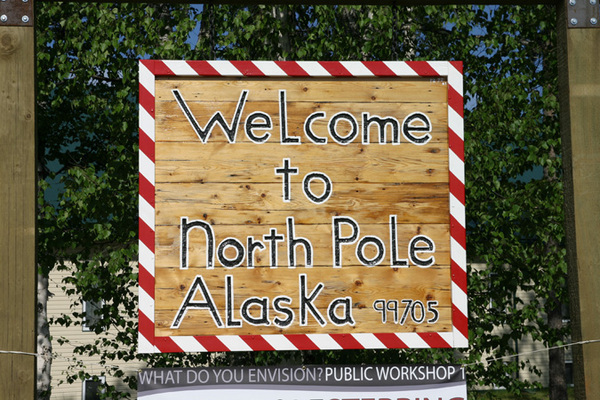 North Pole is just 10 easy miles south of Fairbanks on the Richardson Highway and 140 miles south of the Arctic Circle. Moderate rainfall, dry air and nearly 22 hours of daylight on the longest day of the year characterize North Pole in the summer months. Frequent Aurora Borealis displays are seen in the winter. 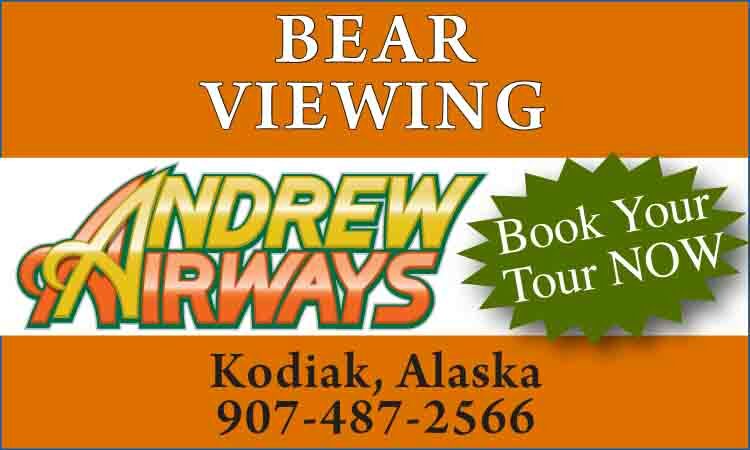 Whatever the season, visitors will find this small and friendly town a delight to visit with a full complement of services, including shopping, dining and many exciting events during the year. 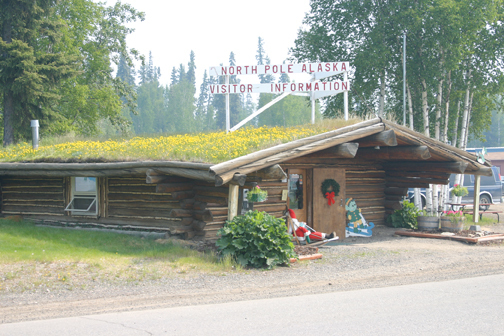 In 1944, the area now known as North Pole was homesteaded by Bon Davis. Later, the Davis homestead was purchased and subdivided by a development company and it was named North Pole in hopes of attracting the toy industry to manufacture articles made in “North Pole.” While this endeavor failed to blossom, North Pole has continued to grow as the city where the spirit of Christmas lives year round. 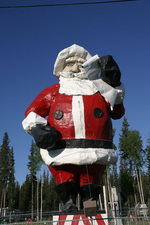 Streets bear holiday names such as Santa Claus Lane, Snowman Lane, Holiday Road and Kris Kringle Drive. City street lights are decorated in candy cane motifs and many buildings are painted with Christmas colors and designs. 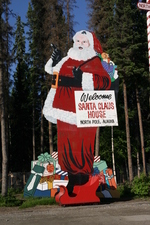 Santa Claus House, a gift shop and “home” to Santa serves as an official landmark. Live reindeer and Santa himself are available for photographs year-round and each year the community starts the holiday season with candle and tree lighting ceremonies. Letters from Santa Claus bearing the North Pole postmark may be mailed anywhere in the world. North Pole Christmas in Ice is a magical event that lights up the Christmas season with international ice carving competition, kids carving challenge and fireworks display. The children’s play area in the Ice Park features playground equipment made entirely of ice and snow. Individual ice sculptures portraying various aspects of Christmas inspire viewers and bring out the sentiment of this holiday season. This is an outdoor winter activity for the whole family, with food and beverage concessions available in heated facilities. Santa’s sleigh and reindeer team in ice is an interactive part of the Ice Park with a web cam poised to take your picture seated in the sleigh. The Ice Park is open every day in December with special events planned during each weekend. 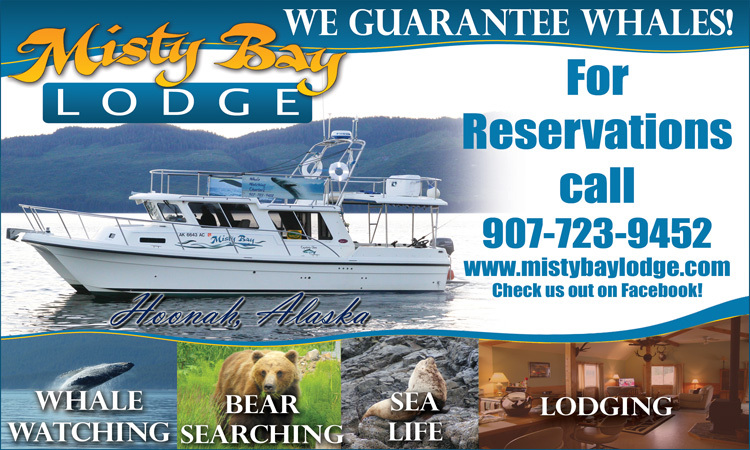 North Pole is bordered by the Tanana River and surrounded by lush green forests, providing numerous opportunities for recreation. 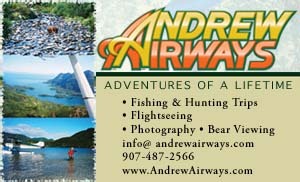 Enjoy camping, hiking, swimming, boating and fishing at nearby Chena Lakes Recreation Area. food booths and Summer Street Dance.